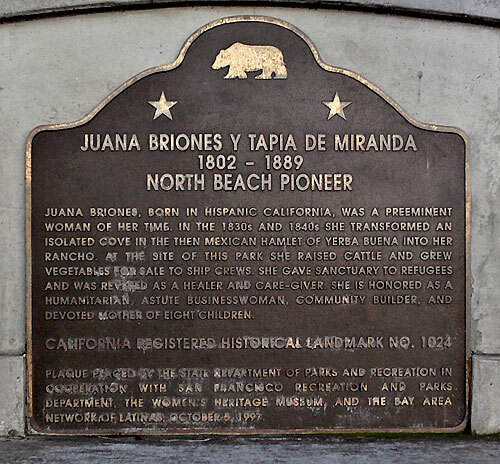 Juana Briones, born in Hispanic California, was a preeminent woman of her time. In the 1830s and 1840s she transformed an isolated cove in the then Mexican hamlet of Yerba Buena into her rancho. At the site of this park she raised cattle and grew vegetables for sale to ship crews. She gave sanctuary to refugees and was revered as a healer and care giver. She is honored as a humanitarian, astute businesswoman, community builder, and devoted mother of eight children. 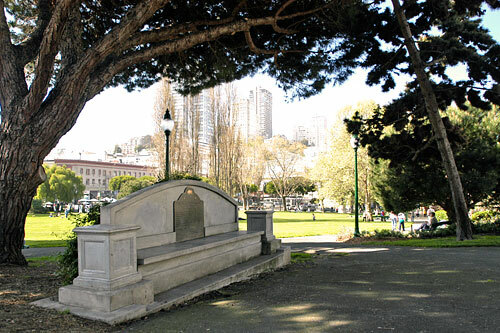 Plaque placed by the State Department of Parks and Recreation in cooperation with San Francisco Recreation and Parks Department, the Women's Heritage Museum, and the Bay Area Network of Latinas, October 5, 1997.